Gaelic Polytheism often mentions “the three realms” of land, sea and sky as being a central concept to the structure of its rituals for many (if not all) practitioners. Other than the fact that they are sometimes called An Thríbhís Mhòr (The Great Triple Spiral),1 rarely is there much more said about it. Questions we’ll explore in the following section, then, is where does this concept come from? What are the sources? What did each realm represent in tradition? How are they relevant to modern practise? Nowhere is the concept the three realms stated more clearly than in the Táin Bó Cuailnge (The Cattle Raid of Cooley, often referred to as the Táin for short), a tale belonging to the Ulster Cycle – thought to contain some of the oldest tales in Irish myth by modern scholars.2 Although the tales themselves were written down in the Christian period (from around the seventh century onwards, but most tales surviving in manuscripts from the eleventh up to the seventeenth centuries), many scholars feel that while some parts of the tales may have been altered, added to or subtracted from to adapt them to more Christian tastes, much of the content is still pagan in origin and influence – even if not overtly so. Being the oldest body of Irish myth, the Ulster Cycle can perhaps be relied on to retain some of the most authentically pagan content of all the tales under the Christian glosses. One passage from the Táin in particular illustrates the idea of the three realms nicely, and as the longest and most developed stories within the whole body of Irish mythology we can be relatively confident in saying that it reflects a large amount of traditional Irish perceptions on the way the world works. In general, the Táin is a story about how one woman, the Queen of Connacht (Medb) decides to raid her arch-enemy, the Ulaid (Ulstermen), in order to capture their best bull – the finest animal in all of Ireland. 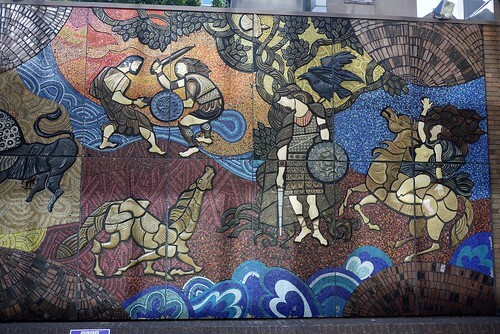 The hero, Cú Chulainn of the Ulaid, is forced to fight against Medb’s men alone, his fellow Ulstermen being unable to fight because of a curse that has been laid on them – as told in the tale The Labour Pains of the Ulaid. Sualtaim, Cú Chulainn’s father (also unaffected by the Cúrse, and by implication, not a man of the Ulaid himself – possibly explaining why Cú Chulainn is unaffected although Cú Chulainn’s origins are clouded in confusion and possible divine origin), sees his son’s valiant efforts against the enemy, and goes to the Ulster king to try and persuade his men onto the field. Finding the king, Sualtaim cries: “Is it the sky that breaks or the sea that ebbs or the earth that quakes or is this the distress of my son fighting against odds on the Foray of Cuailnge?”3 Straight away, Sualtaim invokes the concept of sky, sea, and earth – in this instance to illustrate the point that either nature itself is being turned upside down, or his son’s plight is desperate indeed. By implication, Sualtaim’s connecting the two – nature and his son – makes no odds. Either way, the outcome will be calamitous for the men of Ulaid. In fact, Sualtaim is so desperate to get help for his son that he forgets that he must not speak to the king, Conchobar, first, as etiquette requires. Conchobar’s druid steps forward and gives a dark prophecy – that for his troubles and his lack of etiquette, Sualtaim will die.4 In true form, Sualtaim’s horse rears and throws him, causing him to lose his head; but even when decapitated and dead, Sualtaim continues his desperate pleas for the men of Ulaid to go and help his son. In a way it’s ironic – Sualtaim beseeches Conchobar to help by invoking a formula that suggests the natural order is in array because of Conchobar’s lack of action, a sign of the king’s improper conduct, when Sualtaim (in his desperation) fails to act properly himself. In effect, the natural order of things shall be restored by Conchobar’s involvement and eventual victory in the battle. In his reply, Conchobar uses the same words as Sualtaim did: nem (sky), talam (earth), and muir (sea). Here then, are the three realms that form the natural world in Irish cosmology. Another example of this threefold division can be found elsewhere in the Táin, from Cú Chulainn’s own lips: “I beseech the rivers to help me, I implore the sky and the earth and [the river] Cronn in particular,”7 but one source alone, such as the Táin, does not necessarily suggest that this idea was ‘universal’, so we must look to other sources to see if it has meaning beyond the Táin. Clearly, then, the three realms are seen to represent the natural order. An imbalance in any or all of them – the sky falling, the seas rising – would have apocalyptic results indeed, to an individual or a people. This idea can be seen to be demonstrated in the various oaths and exclamations which can be found in early Irish literature. Like most early legal systems, the Irish believed in an underlying magical power of oaths. Should a person be found to be foresworn, the forces invoked in the oath would be responsible for the punishment (and in the case of the Irish tales, usually the demise) of the oath-taker. While the realms of land, sea and sky can be found in the elemental type of oath (such as those found in the Táin), they are rarely – if at all – sworn upon exclusively. Instead we find them mixed in with the sun and the moon or day and night, for example. In Comthoth Lóegairi co cretim 7 a aided (The Conversion of Lóegaire to the Faith and his Violent Death)10 the King of the Uí Néill, Lóegaire mac Néill, makes an unsuccessful attempt at invading Leinster in order to extract the hefty bórama (‘cattle tribute’) from them. After being captured during battle, Lóegaire swears on the sun and moon, water and air, day and night, sea and land that he will never again try to exact such tribute, and is then released. However, after his release a prophecy is made that says that Lóegaire will die between Ireland and Scotland. Confident that this means he will inevitably die at sea, Lóegaire invades Leinster again, thinking it is safe to do so. Unwittingly, he stands between two hills – Éire and Alba (Ireland and Scotland) – and so the prophecy comes to pass with the elements rising up and killing him for breaking his oath. In Cath Maige Léna (The Battle of Mag Lena), reference is made to only the earth and sky in an oath: “It is our word that unless the earth swallow us, or unless the sky fall down upon us, we will not give as much as an inch, or take one step back in defending you!”12 While the realm of the sea is missing, the comparison to the formula used in the plea by Sualtaim is unmistakeable. While Christian in context, this adoption of the pre-Christian realms alongside other elements of God’s creation is by no means unique. It is perhaps most explicitly outlined in the twelfth century Saltair na Rann (Psalter of the Staves or Quatrain), where we are told “Dia . . .is e do-roine nem 7 talam 7 muir. ‘God, it is He who made heaven and earth and the sea.’ ”15 Such was the strength of the tradition that the Irish concept of earth, sea and sky was imposed on the dualistic Christian concept of heaven and earth. Another example to be found is from the tenth century poems of Blathmac, a body of poetry that focuses on the praise of God and his creation in the natural world. Blathmac’s work once again reaffirms the idea of land, sea and sky as being important to Irish cosmology. In one poem, Blathmac writes, “muir mas, nem nglas, talam ce”, which translates as, “the beautiful sea, the blue heaven, the present earth.”16 Although nem is translated as heaven here, it still retains the meaning of sky. Still more examples can be found in the body of traditional charms and songs collected by Alexander Carmichael in the Highlands and Islands of Scotland towards the end of the nineteenth century, giving us evidence of how enduring the tradition was. Since they have firmest base. Since they have the swiftest body. It is perhaps no surprise that charms for healing such as these tend to rely on the elements and realms that make up the whole of creation, since they represent balance and wholeness – something lacking in a diseased body – just as Conchobar points out the balance of the three realms as an indication of his right action in the Táin, discussed above. Almost the exact same wording can be found in songs 286 and 288, which seem to be variations of the same blessing (presumably having been altered slightly over time within the families that passed them down). It can be seen then, that the three realms are an enduring tradition found in various forms in Ireland and Scotland, from the Táin and other early Irish literature to more overtly Christian (and yet uniquely Irish and Scottish) examples. The use of the three realms in oath taking, and evidence for their representing the whole of creation in the Saltair na Rann, that is somewhat at odds with the Bible, is perhaps one of the clearest signs of their pre-Christian origin and significance, whether they are mentioned on their own or with other natural elements. In the tales and oaths, the three realms are often shown to be active, destructive forces – the sky may fall, the earth may swallow, the seas and rivers may rise. The earth might be expressed in the form of the sovereignty goddess, who grants abundance and peace on her people when she is treated in the right way; or a plague of birds and beasts might strip the earth if the king rules his people and his land in an unjust manner. Otherworldly birds might come from the sky to whisk away a mortal for a romantic tryst between human and god or Otherworldly character. The sea is the medium by which the various waves of invaders are said to have come from to settle in Ireland; in the form of the Fomorians, it can be seen to take on an adversarial role as well. In overtly Christian contexts, however, the three realms tend to be shown as passive – they are part of God’s creation and not much more, like in the Saltair na Rann or the poems of Blathmac. Although their apparent importance meant the three realms worked their way into Irish versions of the Genesis story, in favour of the Christian duality of heaven and earth, they were nonetheless adopted within a very Christian view. In the tales, the three realms were able to maintain a more active and rounded presence. The three realms represent a wholeness, balance and order to a land that was often (and still is) in chaos – both cosmologically in terms of what we see happening in myth, as well as politically as we see in myth and history. In their use in oaths, charms and blessings, the three realms reinforce the concept of balance and order – to restore it, in the case of the charm to heal a sprain; to express the wish to maintain it or show good will to others in the case of blessings; to reinforce one’s place in it, in the case of protective prayers like St Patrick’s Breastplate; or to indicate the seriousness of one’s conviction in the case of invoking them in an oath. In the case of their appearance in the tales, they illustrate the direness and potential calamity of the situation to the audience. 1 See for example here or here. 3 Mac Mathúna, Irish perceptions of the cosmos, Celtica 23, 1999, p174, with a slightly different version given on p176; Kinsella’s less literal translation: “’Are the heavens rent?’ he said. ‘Is the sea bursting its bounds? Is the end of the world upon us? Or is that my son crying out as he fights against great odds?’ ” The Táin, 1969, p218. 4 Mac Mathúna, ‘Irish perceptions of the cosmos,’ Celtica 23, 1999, p174-175. 5 Mac Mathúna, ‘Irish perceptions of the cosmos,’ Celtica 23, 1999, p176; Kinsella, The Tain, 1969, p219. 6 Mac Mathúna, ‘Irish perceptions of the cosmos,’ Celtica 23, 1999, p175-6. 7 Mac Mathúna, ‘Irish perceptions of the cosmos,’ Celtica 23, 1999, p182. 8 Shaw, ‘A Gaelic Eschatalogical Folkltale, Celtic Cosmology and Dumezil’s “Three Realms”,’ Journal of Indo-European Studies, Volume 35, 2007, p250. (Also in Celtic Cosmology: Perspectives from Ireland and Scotland, edited by Jacqueline Borsje, Ann Dooley, Séamus mac Mathúna, and Gregory Toner). 9 Kelly, Early Irish Law, 1988, p198. For a more readily available discussion of types of oaths in general, see Oaths. 10 See here for a full summary of the tale. 11 See The Metrical Dindshenchas. 13 See Blessings and Good Wishes. 14 See St Patrick’s Breastplate. 15 Mac Mathúna, ‘Irish perceptions of the cosmos,’ Celtica 23, 1999, p185. 16 Mac Mathúna, ‘Irish perceptions of the cosmos,’ Celtica 23, 1999, p181. 17 Song 446. Carmichael, Carmina Gadelica, 1992, p410. 18 Carmichael, Carmina Gadelica, 1992, p411. 20 Carmichael, Carmina Gadelica, 1992, p267.